Successfully Added Ulefone Armor 2 Android Phone - Android 7.0, 6GB RAM, 5-Inch FHD, IP68, Dual-IMEI (Gray) to your Shopping Cart. As the name of this Android phone suggests, the Ulephone Armor 2 is an extremely tough and powerful smartphone. It features an IP68 waterproof design that makes it fully resistant to water, dust, and drops. Therefore, you won’t have to worry about carrying it along into tough environments. Your phone comes packed with a whopping 4700mAh battery. This cell brings along up to 7 hours of usage time. Thanks to this, you’ll be able to head out with confidence as you can be guaranteed that this Android phone will get you through the day no matter where you’re headed. On its beautiful 5-Inch display, this rugged smartphone treats you to a stunning Full-HD experience. It supports 1080p resolutions thanks to which you’ll be able to watch the latest movies and series in their fullest glory. You will be treated to 64GB internal memory that can be extended via its 256GB SD card slot. Therefore, you’ll always have enough storage to keep your files and media at hand. Along with its Android 7.0 operating system, this latest smartphone will treat you to a smooth user experience no matter what you throw at it. 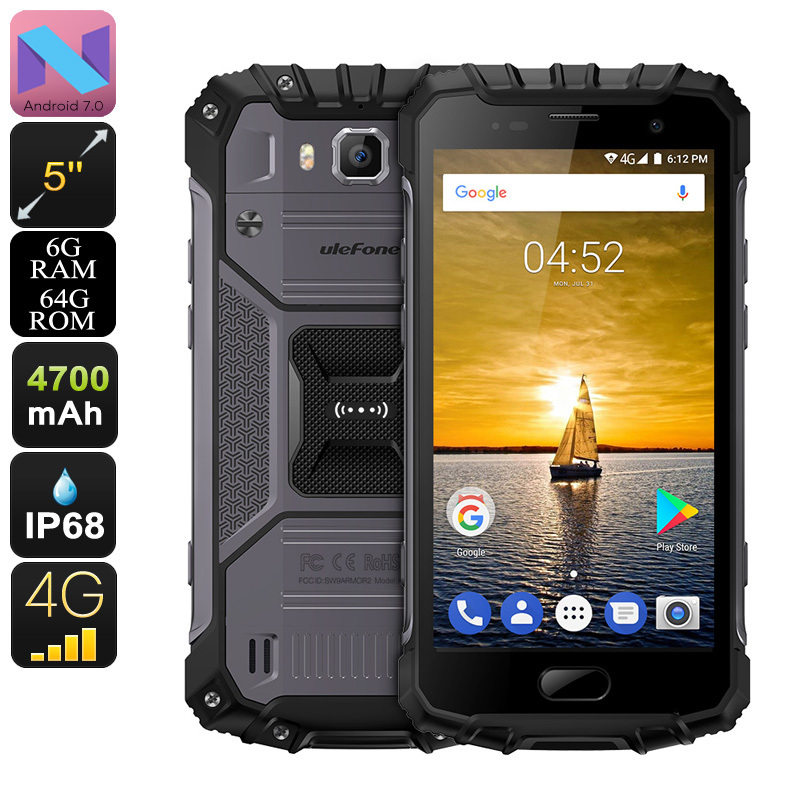 Within its rugged body, this Android phone packs 6GB RAM and the MTK6757CD CPU. This powerful processor has been clocked at 2.6GHz and is capable of tackling the latest software features out there. The phone furthermore treats you to Dual-IMEI numbers, 4G, and Dual-Band WiFi. This will provide you with great connectivity no matter where you’re at. With the Ulefone Armor 2 at your side, you’ll always stay connected to friends and family back home. The Ulephone Armor 2 smartphone comes with a 12 months warranty, brought to you by the leader in electronic devices as well as wholesale Android phones..